NETWORK FINALS: It was a good night for CBS in adjustments, with 0.1 bumps for MAN WITH A PLAN, SUPERIOR DONUTS and SCORPION. (But not THE GREAT INDOORS.) THE VOICE also gained 0.1. CABLE HIGHLIGHTS: After a weekend without games on cable, the NBA PLAYOFFS resumed on TNT and scored the highest ratings of the night at 1.82/1.46, led by Houston vs. San Antonio. (NBC Sports Net’s NHL PLAYOFFS game was at 0.72.) VH1 billed the night’s LOVE & HIP-HOP as a “special,” so its content may explain why it fell 0.39 from last week to 1.08, with BASKETBALL WIVES down 0.11 to 0.93, and TI & TINY down 0.04 to 0.83. USA’s WWE telecast was at 1.06/1.00/0.96, compared to last week’s 1.05/1.04/1.00. Discovery’s STREET OUTLAWS ticked up to 0.95, and VEGAS RAT RODS was down 0.04 to 0.50. On MTV, TEEN MOM jumped 0.15 to 0.65, and the AFTER-SHOW was up 0.02 to 0.40. AMC’s BETTER CALL SAUL grew by 0.06 to 0.58. 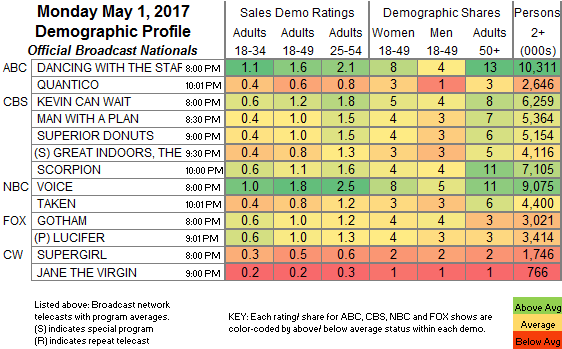 On TBS, AMERICAN DAD fell 0.06 to 0.47, and ANGIE TRIBECA ticked down to 0.24. On Bravo, SOUTHERN CHARM dropped 0.11 to 0.40, and SWEET HOME OKLAHOMA was down 0.04 to 0.22. 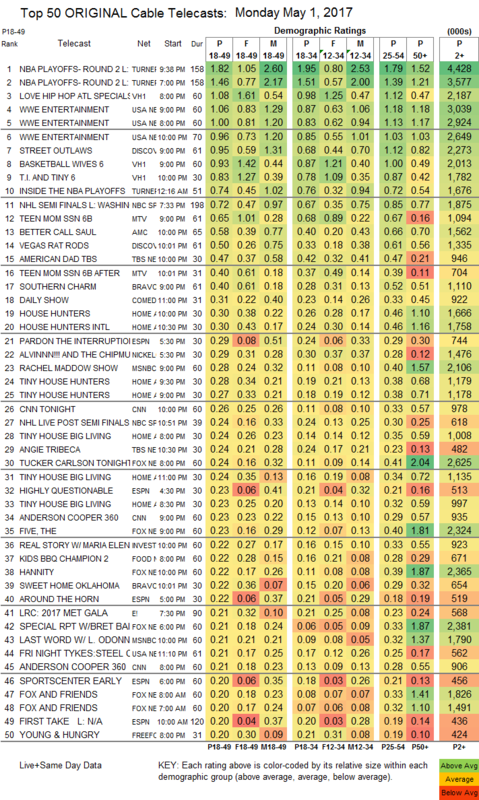 On HGTV, both HOUSE HUNTERS and HOUSE HUNTERS INTL were at 0.30, respectively up 0.04 and 0.06, and TINY HOUSE HUNTERS was at 0.28/0.27, exactly the same as last week. On Food Network, KIDS BBQ CHAMPIONSHIP premiered at 0.22, and HELP MY YELP was down 0.07 to 0.15. On Freeform, YOUNG & HUNGRY and BABY DADDY were both at 0.20, respectively up 0.06 and 0.05, and THE TWINS was up 0.02 to 0.07.